→Yummy Food, New Year’s Resolutions & More! Yummy Food, New Year’s Resolutions & More! It’s going to be hard to stick with New Year diets with Galveston Restaurant Week in full swing. You have until Jan 25 to sample yummy prix-fixe lunches and dinners at attractive $10-$40 price points. Visit the official site to check out the menus of the participating restaurants. 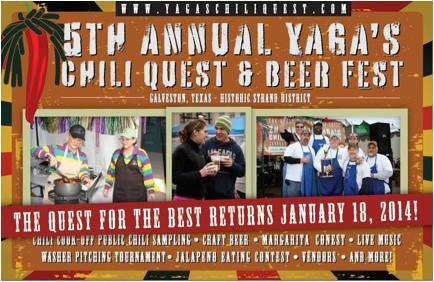 While we are talking food this weekend it’s Yaga’s 4th annual Chili Quest and Beer Fest. As well as the food and beer sampling there’s also a 5k fun run/walk and vendors selling crafts and other goods. Another good cause is the Go Green Galveston (3G) project to bring curbside recycling to residential homes on the Island. Check out the flyer for more details or call 409-497-2460. If you love Galveston. Be social and share my newsletter.